Two art fabricators push the material’s boundaries with a line of experiment-driven furniture that’s designed to perplex. Quincy Ellis and Nebojsa “Shoba” Seric want you to question everything. 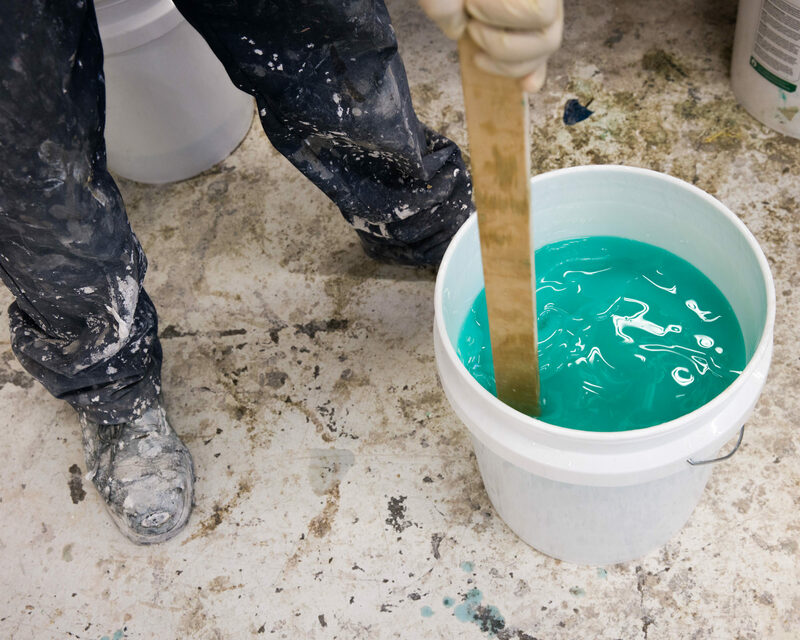 Case in point: the art fabricators behind Facture Studio create mystifying patterns in a new line of molded epoxy resin furniture that will debut on May 20 at ICFF in New York. Their experimental techniques include varying pigment concentration to achieve subtle color shifts, pouring in layers to make stripes, and designing wooden cores in special shapes that affect the appearance of the translucent resin on top. But they also find magic in the inexplicable. 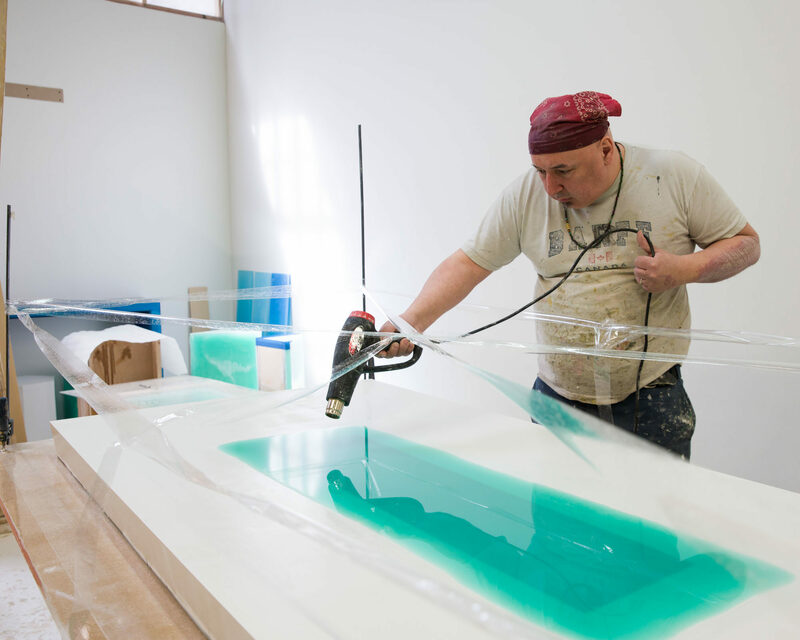 “The feeling that we’re going for is our own mystification of how the resin works, and how to create situations where you can’t understand what you’re really looking at,” says Ellis. Adds Seric, “We want to confuse the audience; we want to perplex.” Ahead of their launch, the designers invited Surface to their studio in Brooklyn’s Greenpoint neighborhood to discuss their design philosophy, fine art influences, and goals for their brand. Jeanée Ledoux: You two have been working behind the scenes as fabricators for artists such as Daniel Arsham and Fernando Mastrangelo for many years. How and why did you decide to create your own line of furnishings? 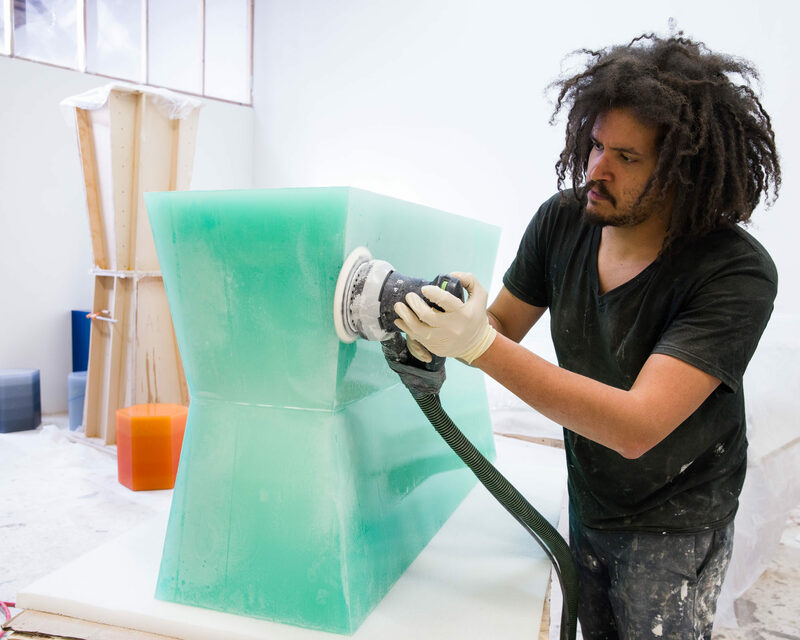 Quincy Ellis: Shoba and I started working together in art fabrication in 2010, and began sharing a studio space together in 2014, right around the time I started working for Fernando Mastrangelo. It was during this time that I wanted to get back to working in the design world, and working for Fernando was a great bridge. I saw his rise in the design/art/furniture world. So it opened the door for me to think, Oh, it is possible to design sculptural but functional objects that can be turned into a viable business. That definitely inspired Shoba and me to start thinking about what we were attracted to aesthetically and what we could envision ourselves making together. We both love solving fabrication and aesthetic challenges for other artists but started our fabrication company with the goal of doing this for our own work. And then Fernando invited us to do a piece for his “In Good Company” group show last fall. Shoba Seric: Which was a pivotal point. 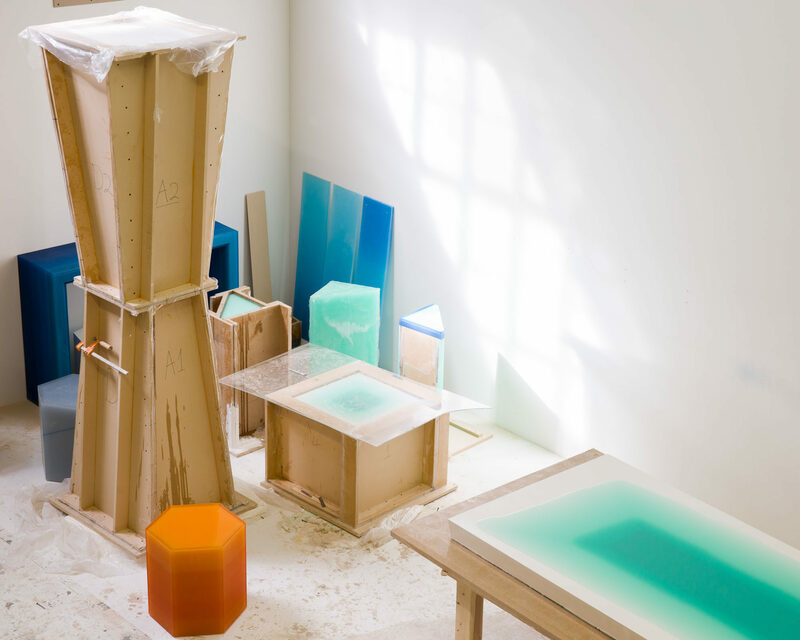 QE: We had been talking about doing these resin furniture pieces forever, and that really motivated us to move from small tests to invest in making a real piece, a blue console table, for the show. JL: It’s not obvious how your pieces are made, what lies beneath the resin, et cetera. Do you intend to provoke questions? QE: The feeling that we’re going for is our own mystification of how the resin works, and how to create situations where you can’t understand what you’re really looking at. The same feeling we’re having while making these pieces is what we want people to have when they look at them. SS: We want to confuse the audience—we want to perplex. We want people to think about what’s going on instead of just getting something right away. QE: Especially as fabricators, if you go around and look at pieces and you say, “Oh yeah, you just put this and that, and you sand it like this,” then there’s no mystery. When I see mystery in a piece, when I have no idea how it’s made, it’s very exciting to me. JL: What are your roles in the business? SS: Quincy’s a genius when it comes to mathematics and calculation. But then he turns things around and throws himself into the depths of the visual universe, and we start bouncing around ideas and possibilities. It looks like a tennis match, where we hit the ball back and forth until the final idea is made. QE: Shoba is the stereotype of the crazy artist in terms of ideation. He pushes me outside the strict limitations of what we can do right now, and then we explore these outlandish ideas that we can take back to earth and implement. When we’re thinking about our story and the direction we want to go philosophically, Shoba’s a big part of that. JL: Shoba, you have a history of creating conceptual, sometimes provocative art. How does that inform this more practical venture? SS: In Bosnia I basically grew up on the paintings of Kazimir Malevich, Wassily Kandinsky. And then, of course, you have the entire minimalist movement, from Robert Morris sculptures to, let’s say even, Dan Flavin and James Turrell. The problem with art these days is that it has become so arbitrary. Everything has become so much about money, about selling at art fairs and galleries. Art kind of lost itself in many ways as an honest and sincere activity because of extreme commercialization. I find that now my earlier work as an artist would not be honest as a commercial product. It feels better to be up-front about making just aesthetically pleasing sculptural furniture. Actually, we were joking the other day: I much prefer my sofa than a painting on the wall. Because I really love my sofa. I stretch out—I’m so comfortable! I watch a movie, I eat, I fall asleep. A painting, I don’t even notice that much. But the sofa actually makes me happy. JL: Tell us about the new techniques you’re showing at ICFF and about your goals for the line. QE: For ICFF we’ve developed four new techniques that explore gradient saturation, depth using objects, illusion, and lighting. The most dominant technique is the stepped gradient. We’ve adapted this to a side table, console, and wall piece. We’ve had so many questions about using our pieces for lighting that we’re releasing a sconce that uses the technique as well. SS: We wanted to show lots of different ideas to make clear that we are about endless experimentation, and that any technique we come up with can be used in many different ways. QE: As for our goals, we want to keep expanding our understanding of the material and see how far we can take these pieces. Ideally, through working with interior designers, we can reimagine techniques and colors to create more new pieces, which is what motivates us. We could also see having our pieces in furniture and art galleries in order to further blur the lines between art and furniture. SS: Every day we have new ideas we want to try. I don’t know if in this lifetime we’ll achieve what we have planned so far.